Our last Lunch and Learn was filled to capacity with a waiting list … so we’ve scheduled another for Thursday, June 1 at 11:30 a.m. to ensure nobody misses out! 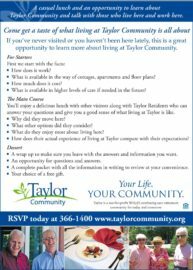 We invite you to come meet our friendly residents, enjoy a delicious lunch and find out more about the best continuing care retirement community in the Lakes Region. To RSVP, please call 366-1400 today!